Victor Nagbe has come to show Aussie Fight Fans the meaning of ‘tough’. Born in Liberia, Nagbe made his way to the NTG gym in Brisvegas via the refugee camps in Guinea, West Africa. He aims to make his mark on the Australian – and international – fight scene in the tradition of the world’s best technical fighters. How old are you, Victor? How many fights have you had? I’ve had sixteen. I won fourteen, lost one and drew one. Of my wins, four of those were KOs. What weight are you fighting at? And how many years have you been training? How did you get into Muay Thai? I was hanging around late one night, walking the streets with this friend of mine. There was this guy, Mark Christmas, sitting out having a beer. He said to me, “Does your mother know where you are?” I said she did; my friend and I were just out walking around. He asked if I did any martial arts, and I said I knew some Tae Kwon Do. He offered to take me to a Muay Thai school, and he did. That’s how I ended up at Dip Muay Thai. I started fighting and training, but I was still at school. When I finished high school, I made the decision to train full time. And here I am. Originally, I am from Liberia, in West Africa. From there, my mother, sister and I went to a refugee camp in Guinea. In Africa, life is hard. You have to fight to eat. I came [to Australia] in 2005. Does your mother come and watch you fight? My aunty came to Evolution 25 and watched. I fought the best I could to make her proud of me. What is it you like about training at NTG? It’s hard! The standard is very high. Also, the gym has a very good name and you feel responsible for it. I liked training at Dip Muay Thai, but my family moved away from the area. It was really far to travel, so I started at NTG. Both Nugget and Soren are my pad holders. Nugget focuses more aggression and power. With Soren, it’s more focused on technique. Who do you spar with? Can you tell us a bit about your experience of each of them? I spar with everyone who is under ninety kilos; Daddy Kool, Ghot, and Soren. They are excellent to spar. Very skilled; highly technical. Do you have any pre-fight rituals or superstitions? I always think about the way I want the fight to go [beforehand]. I think about how I want to be the best. I know that NTG has a good name, and I feel responsible for it. I don’t want to let Nugget and the boys down. How would you describe your style? Can you explain a bit about how you like to fight and where it comes from? I’m very focused on technique. I watch lots of fights, and I learn from watching. I like Yodsanklai. His technique is simple and heavy. That’s the way to go. Who are the fighters that you emulate and look up to? Senchai, Yodsanklai, Soren Mongkontong, and Daddy Kool. Who has been your toughest opponent so far? Jim Irwin. I fought him on Evolution 25. We both hit each other as hard as we could. I gave him everything I had and I was left wondering, ‘What do I have to do to stop this guy?’ In the end, I won the fight by split decision. Could you nominate a career highlight? For highlights, there’s more to come. I want to fight the biggest names, because they bring the biggest opportunities. What’s your most memorable experience so far? 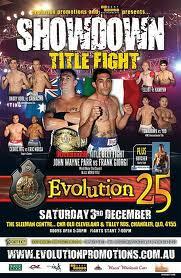 It would have been when I went down to Melbourne to fight on ‘Warrior’s Way 5’. I stayed at the Hilton Hotel! I travelled to fight – it was my first time out of Brisbane. It felt like a holiday! I won my fight, I got to travel and see Melbourne and I didn’t have to pay for anything! This entry was posted on August 16, 2012 at 10:02 am and is filed under Journalism, Kickboxing with tags Daddy Kool, Dip Muay Thai, Evolution 25, Hilton Hotel, Jim Irwin, Liberia, Mark Christmas, Muay Thai, NTG, Nugget McNaught, Senchai, Soren Mongkontong, Victor Nagbe, Warrior's Way 5, West Africa, Yodsanklai. You can follow any responses to this entry through the RSS 2.0 feed. You can leave a response, or trackback from your own site.